VBS: Vacation Bible School Needs You! You may remember in 2017 we traveled to Rome to meet Paul. Last year we met Daniel in Babylon. This year we will escape to Athens to meet up with Paul again! Vacation Bible School 2019 will be held the week of June 24-28th on the Country Church grounds from 9am-12pm each day. Preschool-6th grades will begin at the Festival Pavilion and move around the Festival Grounds and in Disciple House. We need many people to make VBS a success, so please consider where you might be able to help. We need people to prepare decorations, to set up and to help us host the week. If you are entering 7th grade in the fall or older, please see the list below to see where you can help us have the best St. Joseph Parish VBS yet!! Oikos leaders are in charge of a group of 10 or fewer children of mixed ages, Preschool-6th grade. Will help your oikos get to where they need to be and take care of them, helping connect their Bibletimes experiences at VBS to real life. Assist Oikos Leader in working with the children of multi-aged group of 10 or under in whatever is needed; pray together, play together and have fun!! You will be given a choice of Athenian shops to open. Every day, groups of kids will come to learn about your shop and "buy" items. 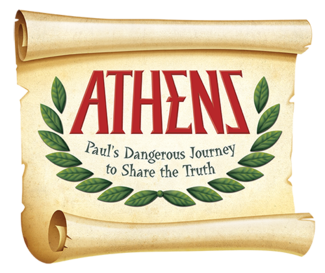 You will be given a script and tell the children what it's like to live in Athens. Assist with check in and registration on Monday and then be available in the same spot to assist anyone who comes to you the rest of the week, supervising the marketplace periodically to be sure shopkeepers have all they need and all is running smoothly.